There are more than 2,500 drones registered in New Hampshire. And with their popularity on the rise you can expect to see more of these unmanned aircrafts buzzing around the Granite State skies in 2017. But drone owners in New Hampshire may have to fly under new rules next year if lawmakers decide federal regulations are not enough. While the number of drones is growing, they are still new and their impact relatively unknown. That has people like Brenda Hambleton of Hollis concerned about where the technology is heading. State Rep. Neal Kurk says it’s time lawmakers provided some answers. The Weare Republican has tried to get drone regulations on the New Hampshire books for three years now and plans to try again when he files another bill the next legislative session. Map: How many drones are registered in New Hampshire? New Hampshire’s only current regulation is prohibiting drones for use in hunting and fishing. That means drone owners in the state must adhere to federal policies, which prohibit flying near an airport and staying below 400 feet. They also must register their drones online. Under Kurk’s bill, drones wouldn’t be able to fly within 250 feet of private property and could not be used to take photos of people without their consent. They also couldn’t be used to stalk or harass people and would have to steer clear of critical infrastructure such as prisons. Since last year, nearly a dozen drones have been spotted flying over the State Prison in Concord, which isn’t illegal under Federal Aviation Administration rules. So far 32 states have passed laws on drones. In New Hampshire that legislation only addressed using drones for hunting and fishing. The New Hampshire’s ACLU chapter is backing Kurk’s proposal. Director Devon Chaffee told lawmakers at a public hearing earlier this year that the bill would address concerns the FAA does not. But New Hampshire business owners who profit from drones disagree. They argue these privacy protections are already on the books through trespassing and voyeurism laws – stressing that further regulation is not needed. According to the New Hampshire Aeronautics Department, there have been very few complaints of drones trespassing or doing surveillance over the years. James Cooper owns UAV America in Nottingham, which manufactures commercial drones for customers in the state, nationally and globally. He says that under FAA rules, commercial drone operators have to be licensed pilots; therefore, he says, they’re not treating drones like toys. “The FAA is regulating pretty significantly and when you are flying around with a $30,000 drone or whatever you aren’t going to be taking any risks,” Cooper said. James Cooper of UAV America tests out a hobbyist drone outside his company’s headquarters in Nottingham. Cooper’s drones are used to inspect everything from bridges to gas pipelines. He even has a customer in South Africa using one to ward off Rhino poachers. Cooper says using drones is not just cost and time effective for his customers, but also safer. Cooper says the proposed policies in New Hampshire may not get in the way of drones carrying out the types of jobs they’re doing, but could curb their growth. “The interesting thing is that new applications are coming to the surface every single day, and where these are going to be used in the future could be anywhere,” Cooper says. Tricia Lambert of the New Hampshire Aeronautics Bureau, the agency charged with overseeing drones, says the FAA is weary about states adopting their own regulations. 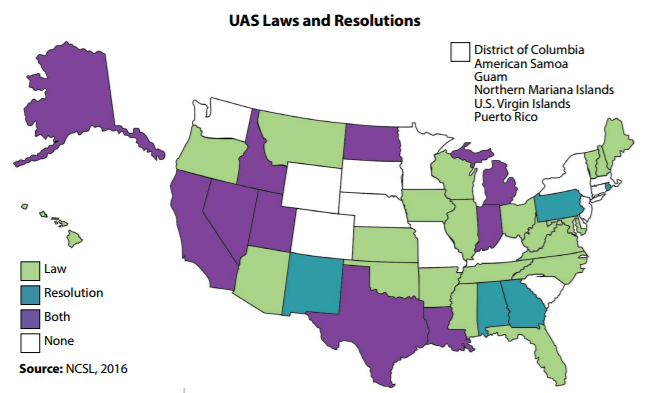 So far, 32 states have passed laws on drones including Maine, Rhode Island and Vermont. Some states require people to take a test before operating; others prohibit drones from taking photos of critical buildings. Now it’s up to lawmakers here in New Hampshire to decide whether the state should follow their lead.